We dosed up on sunscreen, bananas, and bottled water before strapping on our life jackets and hauling our kayaks to the shoreline. On a small dock, Genevieve helped us climb into our kayaks and sent us gliding into the warm sun-speckled water. Once all six of our kayaks were boarded, someone spotted the first manatee and we headed in that direction. Ocean kayak adventure under way! “Doused” up on sunscreen and bug spray. Ready to row! Genevieve, our tour guide! Knowledgeable and funny at the same time. She called our heads coconuts – you know, like on the water bobbing …imagine! Our flotilla consisted of six canoes – one tandem holding the Asian couple and the rest of us rowing solo! The sun was intense, so we added more “eco-friendly” sunscreen. My older brother taught me this little trick of tying a t-shirt around your head when you forget your hat. My sister (background) of course she remembered hers! The Mangroves are home to many species of fish and fowl including this Great Blue Heron. We saw lots of flying fish and a dolphin splashing along this shoreline as well, but never long enough to get a picture. Entering the Mangrove tunnels single-file. Some places were so tight through the tunnels we had to forego the paddles and use the branches to pull our canoes along. The trip was a real workout for both of us! Talk of burger joints and bar-b-q along the final leg got our mouths watering! 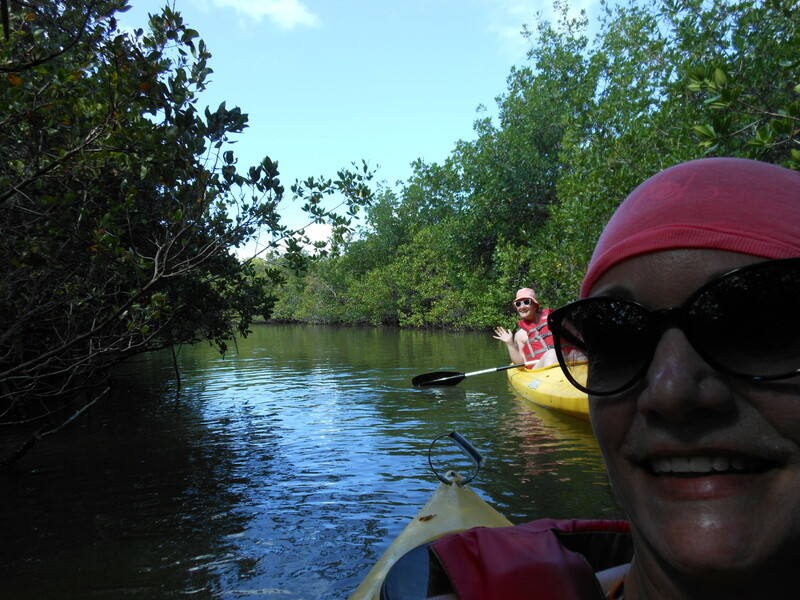 In the final 50 yards of our take out point, a pair of manatees surfaced along our kayaks. The other rowers had already left the water and it was just myself, my sister and Genevieve. We had been talking about our work lives and making those last minute connections when the sub surface ripple gave way to a steely grey body alongside my kayak. I could have reached down and petted the Manatee, but physical contact is illegal. The Manatee rolled down and surfaced right behind my sister’s canoe too! We both lingered there, paddles resting crosswise out of the water, waiting to see what the manatees would do. They swam around us, bumping us from underneath and surfacing briefly to breath. It was so awesome just to sit there floating – an interesting distraction to the “natives.” Finally, Genevieve had to leave for another tour and motioned us to the shore. We could have stayed there all day, but we knew others were waiting. 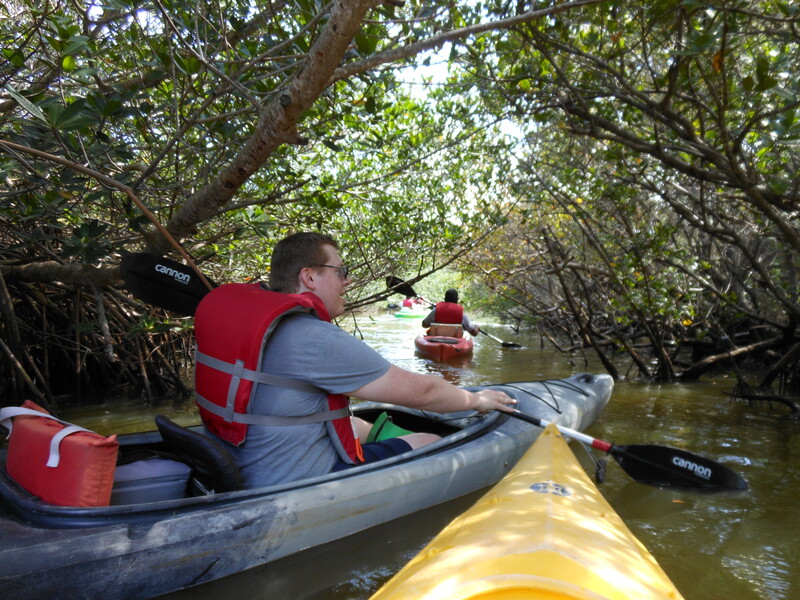 If you’re ever near the Indialantic Area/Cocoa Beach looking for something fun to do, check out Adventure Kayak Tours. It was a great way to see the wilder side of Florida and get some super solid exercise too! Just remember a hat and your SPF 30! !